Water purification - GlobeCore. Oil Purification Systems. The conditions created in the processing area of the AVS allow to carry out practically any technological processes. The plants are particularly effective in industries that require rapid and uniform mixing (especially if the content of components is calculated in units or percentages) where it is necessary to treat suspensions (heterogeneous systems) regardless of their physical phases (liquid-solid, immiscible liquids, such as: water – black oil fuel, gas – liquid), where it is required to apply the finest (monomolecular) coating films to particles of powders or plant seeds and much more. Any operations can be carried out in a vacuum, in a controlled atmosphere or without any protection at normal pressure and room temperature. All processes take place in the same processing space, with the same needles and often with the same mode. The AVS can processes substances in any state, provided that their sizes (for solid phases) correspond to the size of the processing space and needles, the fluids should be sufficiently liquid, and the powders should pour freely. Until recently, the performance of one machine was relatively small, and in order to ensure, for example, the wastewater neutralization of a large enterprise or city, a couple of the AVS units was required. However, at present, as it has been shown before, the machine for 100-1000 m3 / h have already been designed. They removed all performance problems. Technological lines equipped with the AVS have a continuous mode of operation. These lines can be closed systems. The specified features of work ensure their high ecological purity. Preparation of drinking water The problem of drinking water has been actual for a long time. It is still not solved and it is not possible to solve it with traditional technologies in the coming years. Fig. 78 shows the traditional technological scheme for the preparation of drinking water for a large consumer. It consists of a system of filters to treat 4 million m3 , which occupies 20 thousand m2, and a sedimentation tanks for 0.5 million m3 . And worse – it is not specified, where the sediment from sedimentation tanks goes. Such system only cleans from mechanical impurities and disinfects. If the water contains soluble salts, for example, heavy metals, phosphorus or arsenic, the size of the system and its cost grows 2 – 3 times. At the same time, they provide a lower quality of cleaning. But even when the requirements for drinking water are being strict (Table 27) , they are not always fulfilled, especially in remote villages. They take the water, as it was centuries ago, from a river, a lake or even from a pond and use without any cleaning. But times have changed. And if there is somewhere in a vicinity a small tanning factory for treating skins with potassium dichromate, that discharges its waste water without any cleaning into this river. There is no wonder: where the chrome poisoning comes from? There has been thousands of technologies for the purification of drinking water described, but we will not analyze their work. They perform to some extent, but they don’t entirely provide the required quality of purification. Their common drawback: is the use of diffusion method of substance transfer. 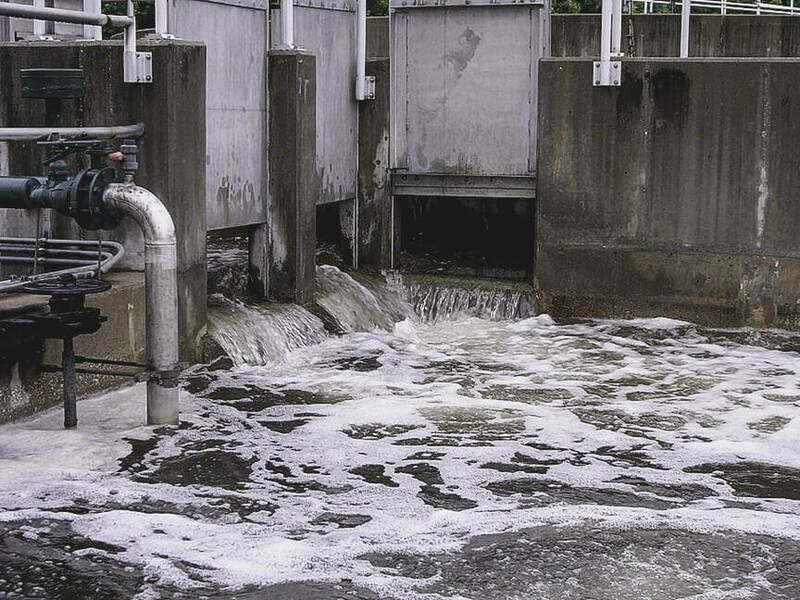 This stops the development of sewage treatment plants, since it requires huge investments, which are unlikely to be affordable for many states. Requirements to the quality of drinking water. The f filtration can be changed for sedimentation. To provide a settlement with a population of 1,000 people, it is enough to have 2 machines, of which one is a spare. The technological line works as follows. First are determined the actual composition of water and the purification regime. The additives for water purification can be lime milk, solutions of soda and iron sulphite (if there is 6-valent chromium) Turn on the pumps 7, 10, AVS , 6, to supply the water from the tank 1 and the tanks with additives 2, 3. The treatment causes the solution to decompose precipitating calcium carbonate, magnesium carbonate, magnesium hydroxide, chrome, zinc, copper and other metals and calcium soap. The pump 7 supplies the suspension to the hydrocyclone separator 8, in which the bulk of the solid phase is separated and enters as sludge into the receiver 12. Then the water is directed to the polystyrene filter 9, for final purification. This water treatment line can have 2 filters with water passing simultaneously through one or both of them (depending on the volume of water flow). According to , at water speed of about 5 m / h, the continuous operation time of one filter is 40-50 hours, after which the filter requires cleaning and the water flow is switched to the second filter. With the help of pump 10, the clogged filter is rinsed with purified water for about 10 minutes, achieving almost 100% recovery of the filter element 9. Given the high chemical stability of polystyrene against the effects of acids and water, the time of operation of the filter element is calculated in years. The washed particles in the form of sludge are discharged into the sludge receiver 13 provided with a replaceable container. Purified water enters collection tank 14, from which it is sent for “revitalization” or to further purification for boilers. The main difference of this option is the use of lime milk and carbon dioxide (or flue gases) which are waste products, instead of expensive soda,. The gases are fed into the processing chamber by the fan 5. In the working zone of the AVS, carbon dioxide reacts with water, carbonate and non-carbonate components and transfers them partially to an insoluble state, thereby lowering the hardness of the water. The additives of lime and aluminum perform the same functions as in option 1. The difference is that, in contact with water, the water vapor contained in the smoke gases condenses by diluting the original water. It should be noted that the amount of water vapor in flue gases is quite significant: C02 – 9.45%; H20 – 18.9%; TM, – 71.65%. With this we can assume that the condensation of water vapor will be almost complete. Such 1 m 3 of smoke, adds 0.15 m3 of water. The result is practically pure nitrogen discharged into the atmosphere, ensuring an environmentally friendly production. There might also be a necessity in the reverse process – in saturation of depleted natural water with calcium and magnesium. For this process is used the line shown in Fig. 79. The tanks 2, 3, are filled with the necessary solutions that are gradually supplied into the flow of water that enters the AVS. If necessary the water then goes through cleaning from solid particles in hydrocyclones 8 and filters 9. If the water is free from impurities, cleaning is not required.